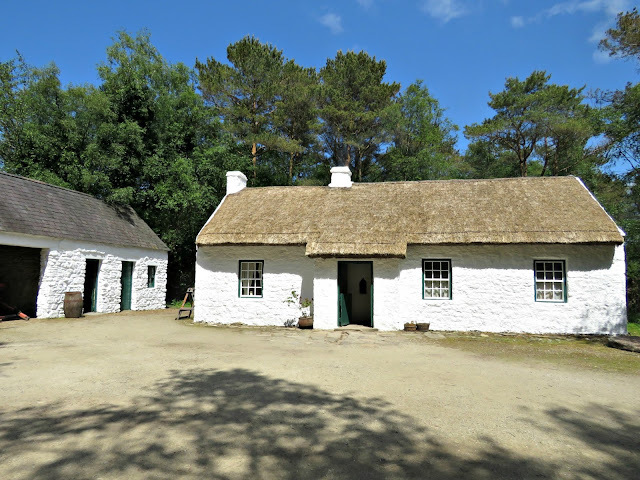 It's hard to think of a time when this folk park, devoted as it is to the theme of emigration, has been more relevant to the world we live in. 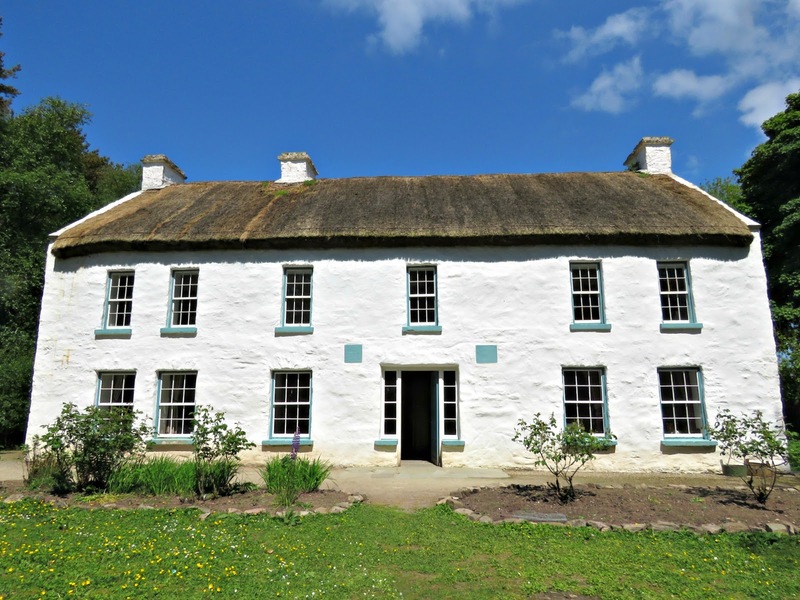 As a child growing up in South Tyrone I visited it from time to time, and found it interesting for the story it told about generations of my countrymen who'd emigrated to seek better lives in the United States. It had a resonance with my own family: each of my four grandparents had at least one sibling who emigrated for economic reasons during the interwar years. 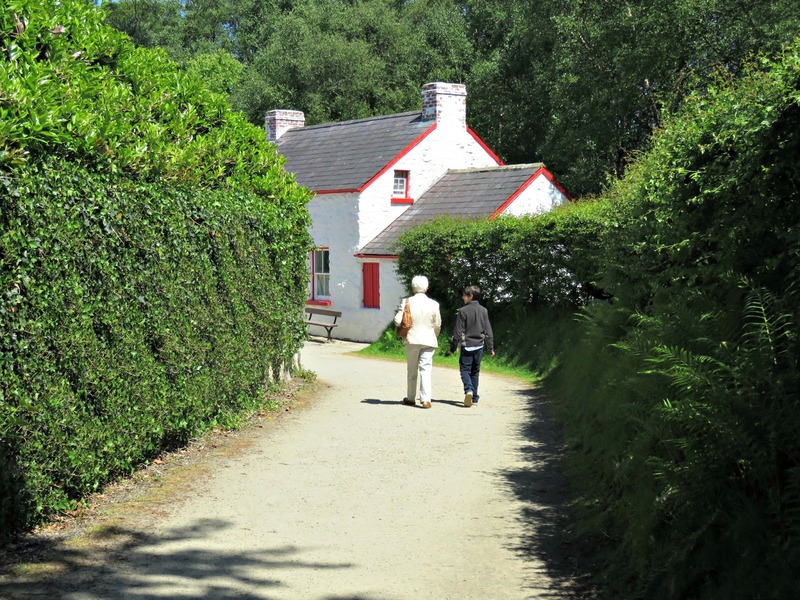 Emigration and the parting with a loved one has been a constant feature of rural life in Ireland for much of modern history. Over the generations they fled famine, persecution, war and civil unrest. In an age in which mechanisation had rendered much manual labour redundant many who couldn’t earn their living in the shipyards and the rope-works set their sights on the west and went in search of a better life. Yet today these background themes that drove them away from home seem desperately contemporary. Part of the park is devoted to telling the story of the infamous coffin ships and the privations of the journey, but the major part is focused on the lives they led in the Old World and the New, at either end of their ocean crossing. The life-stories of various sons of Ulster who made good are given special focus. There’s John Joseph Hughes, the young boy from Augher who went on to become the first Roman Catholic Archbishop of New York, and who laid the foundation stone of St. Patrick’s Cathedral in 1864. His family’s cottage has been moved from its original site, brick by brick, and reinstalled in the park. There’s the printer, John Dunlap, from Strabane, County Tyrone, who took over his uncle's firm in Philadelphia in 1766, and went on to print the Declaration of Independence and the Constitution of the United States. He also founded the Pennsylvania Packet, America’s first successful daily newspaper. 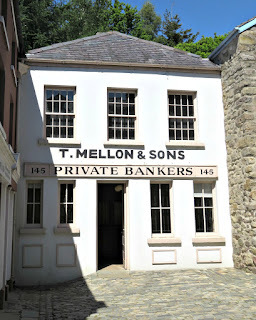 And then there’s the Mellon family, of banking fame, whose Ulster farmhouse is distinguished in having always stood here. The entire park has grown up around the old Mellon homestead. All the other buildings have been painstakingly dismantled, brick by numbered brick, crated and shipped to the park to be re-assembled around it. Some of them have been moved from other parts of Ulster and some have come all the way from America. Thomas Mellon was born in this house in 1813. 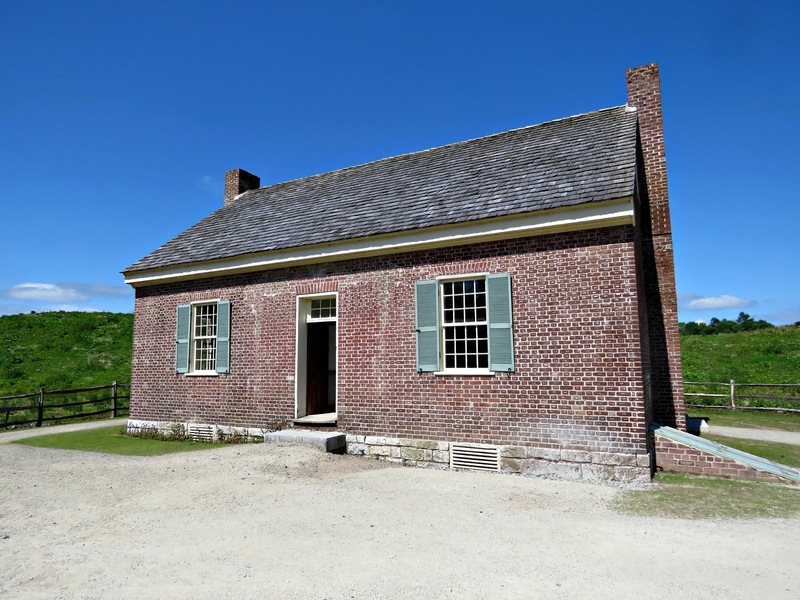 In 1818, aged 5, he made the sea crossing with his family to a new life in Pennsylvania. By dent of hard work, application and thrift, the family prospered. Young Thomas went to university, became a lawyer and later a judge. In due course he went on to found the Mellon Bank, and the rest, as they say, is history. One of the joys of how this park has been built is that you can walk from house to house along country lanes that look as though they’ve been there forever. On a fine spring morning, with the hawthorn in blossom and its scent hanging sweetly in the air, it’s a treat for all the senses. 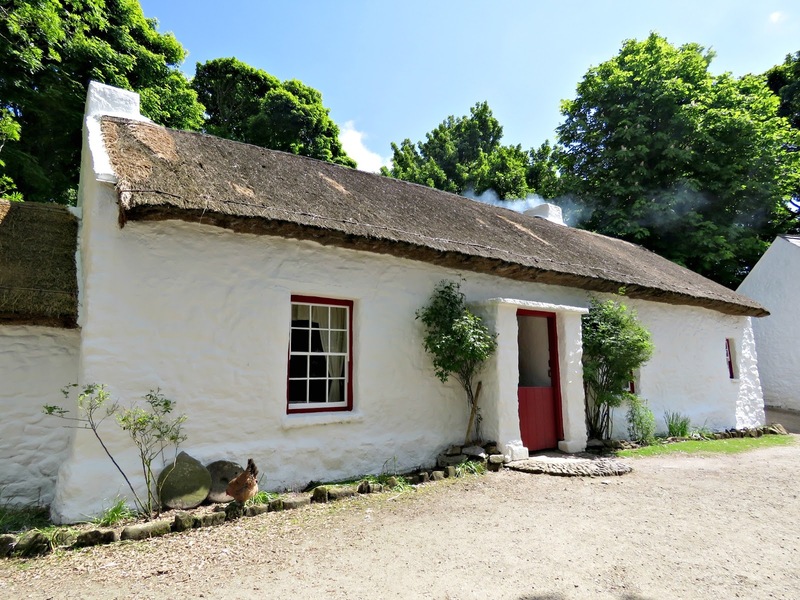 In some of the cottages ladies were baking soda bread and oat cakes over the open fires, which the visitors were welcome to try. Emi was interested to see the old Castletown National School house complete with a blackboard adorned with beautiful cursive script, metal hoops that used to be rolled around the playground propelled by sticks from the hedgerows, skipping ropes, lift-top desks and wooden benches. 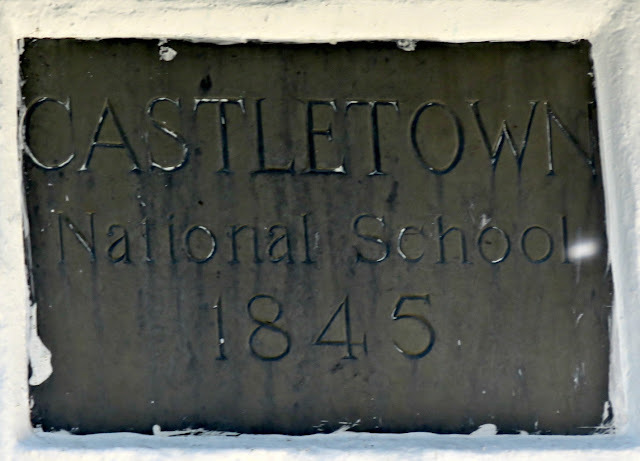 The plaque outside suggests that it dates from 1845, although records indicate that there was a school on the original site from the 1790s. Country children would have walked barefoot to learn to read, write and do simple arithmetic. When this school opened it had around 70 pupils, who would have all been taught together in the single room within. 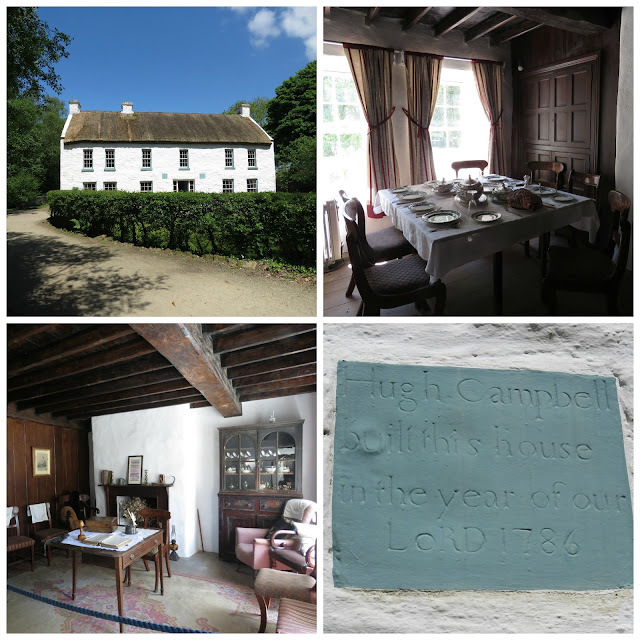 One of my favourite houses was the old Campbell house. It’s one of the grander houses with a fine parlour to entertain, lovely casement windows and a pretty flower garden outside. 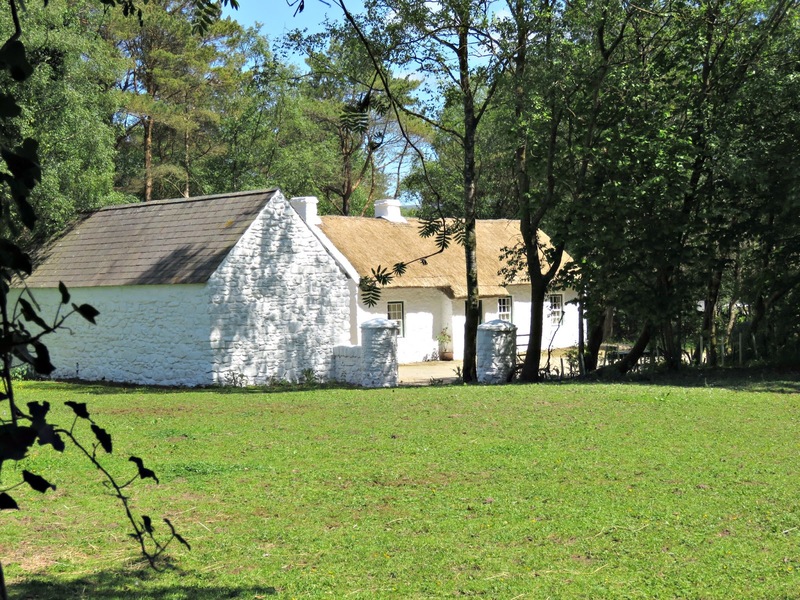 Originally it stood in the townland of Aghalane near Plumbridge, County Tyrone. There’s a plaque announcing that it was built by Hugh Campbell in 1786. Hugh had a family of 12 children, the youngest two of whom emigrated to America. Hugh (junior) left for New York in 1818, but settled instead in Philadelphia, where he became a successful merchant. His brother Robert left in 1822 and worked as a fur trader in the Rocky Mountains before setting himself up as a merchant in St Louis, Missouri. 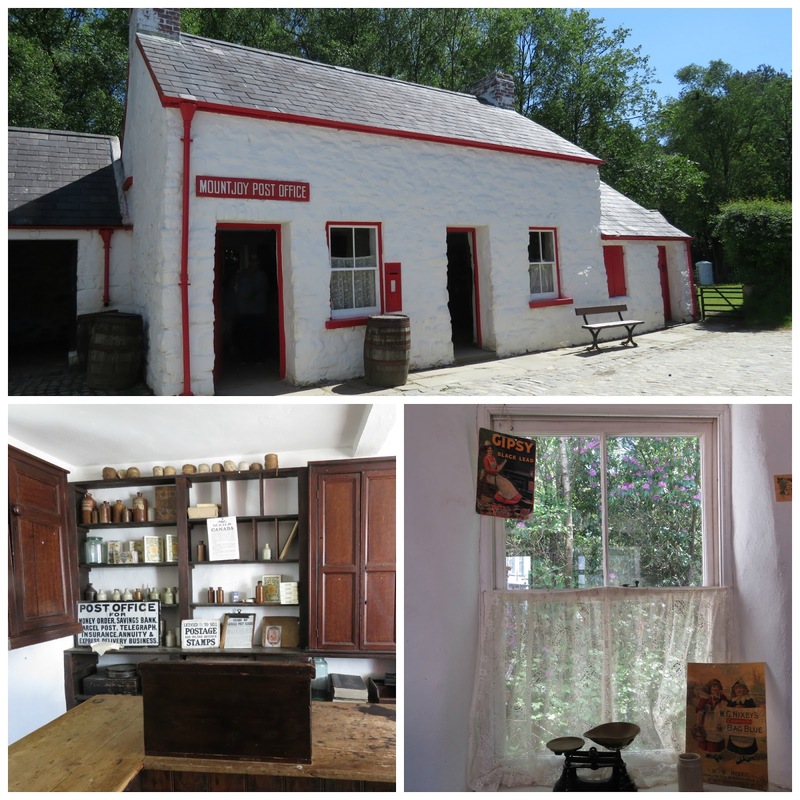 At the end of the Irish section of the park there’s a street of shops called Ulster Street that is a recreation of how the Irish city ports would have looked like as the would-be emigrants waited around for their ship to sail. Back in the day the emigrants would have dreaded being marooned for too long at the docks as they waited for the weather and the tides to align for their great journey. Many of the desperately poor would have watched in despair as their meagre savings were consumed in paying for lodgings. Those with no funds to spare would have slept in the open on the quayside. Others would have been reduced to having to seek passage as indentured servants if their ship hadn’t sailed promptly, or if they fell victim to the many confidence tricksters who preyed on that desperate itinerant community. Today the shops, however, are a joy. 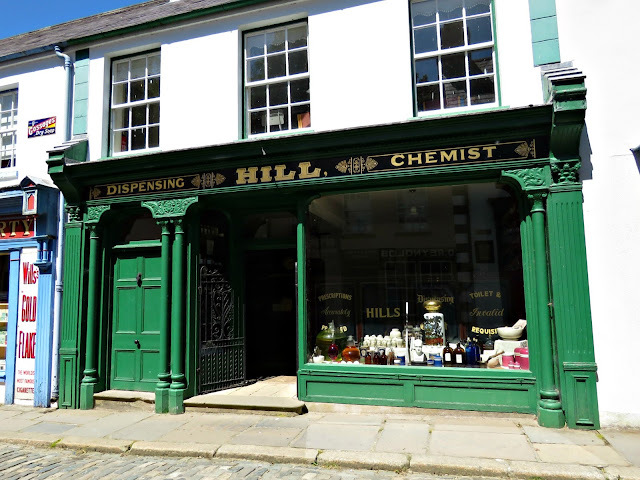 There’s an amazing apothecary, Hills Chemist, from Strabane, with dark mahogany drawers and dozens of crystal jars containing exotic-sounding unguents and potions. I remember a similar such place in my own village, Aughnacloy. 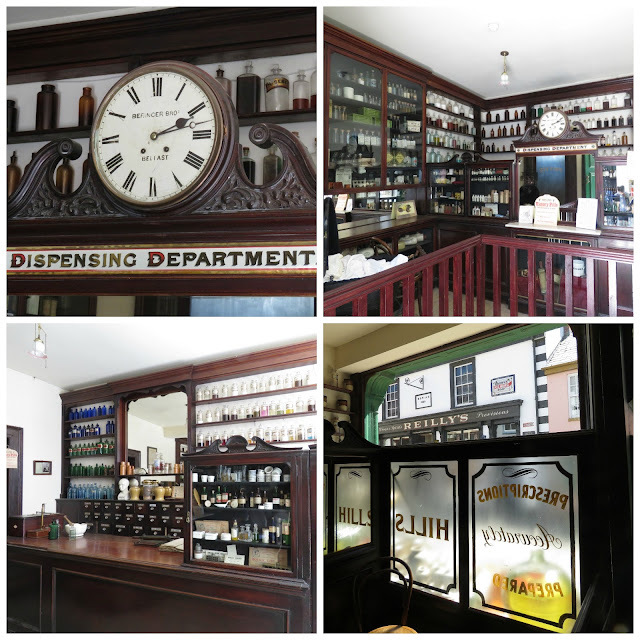 It was run by a kind old lady called Miss Farmer, who'd started up in partnership with another lady called Miss Crawford to run Farmer & Crawford's Dispensing Pharmacy. Miss Crawford had passed on before I arrived, but I have fond memories of an septuagenarian Miss Crawford in her wonderful old shop. She used to give all the children who came in chocolate coins regardless of whether their parents bought anything from her or not. There’s a grocery shop with ling, a salted fish not unlike the Spanish bacalao hanging up with sides of bacon, all kinds of tea, biscuits, carbolic soap and big glass jars of boiled sweets. 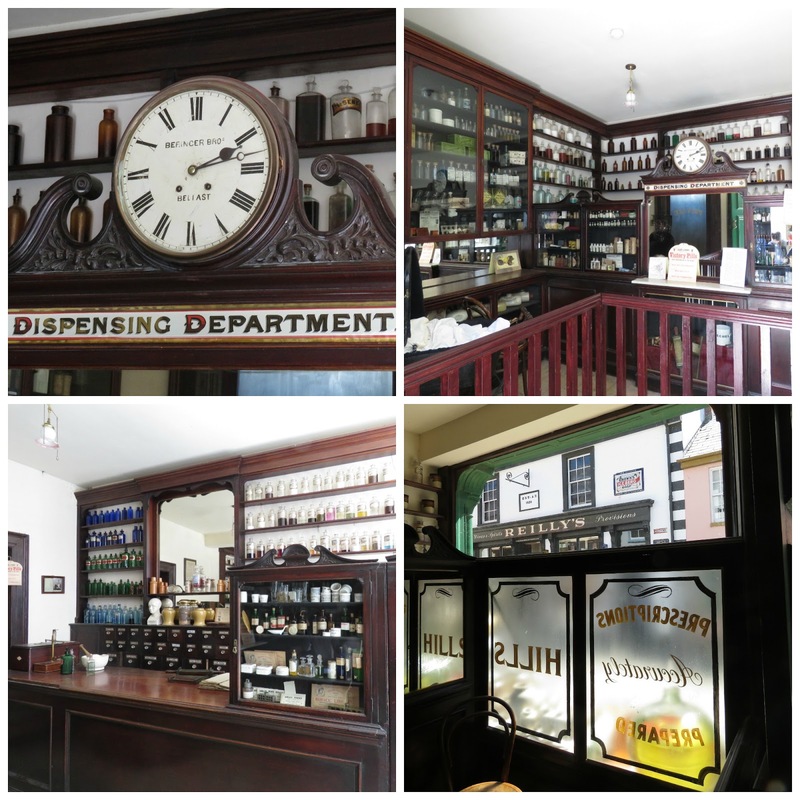 There’s a pub, Reilly’s Spirits Grocer, with snugs, a stand up bar and a grocery section in the back room where people could have bought provisions whilst they drank their stout. And all of this leads to a quayside with a ship that you can walk through to get a feeling for just how cramped the journey below decks would have been. It must have been a scary, gloomy business as whole families were packed in cheek by jowl with no privacy and only the most basic amenities for the 8 to 12 weeks that the Atlantic crossing would have taken. This leads out at the other end to the New World, where there’s a frontier high street to mirror Ulster Street. This one comes complete with a branch of T Mellon & Sons’ Private Bank. Outside of town, the first house in the New World is the Samuel Fulton stone house, which feels like it's just a step away from the Devine family house in the Old World. It's an original stone-built house, transported brick by brick to the park from Lancaster County, Pennsylvania. It was once the home of Samuel Fulton, who emigrated from County Donegal. He built the house himself from stones that he found on the land, after the fashion in which stone houses were built in Ireland. 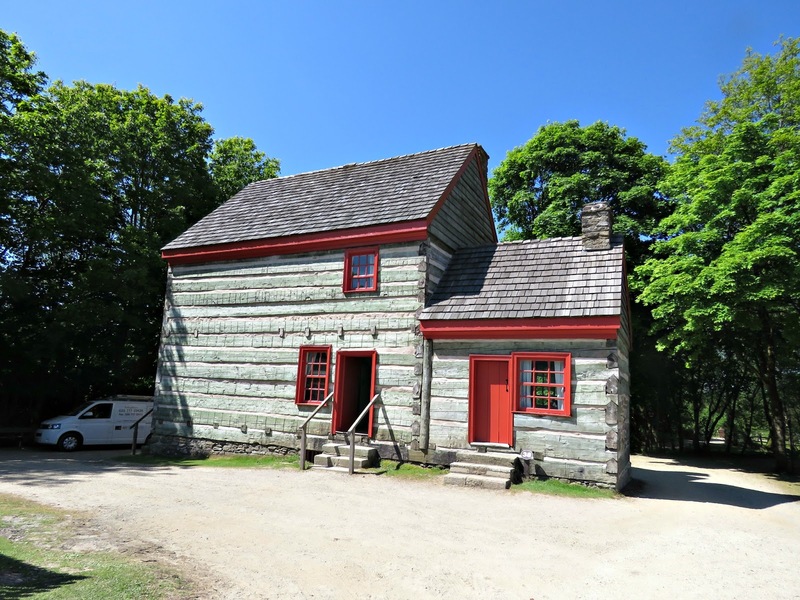 The house straddled a spring so that there was running water in the cool room to keep his provisions cool in the heat of the Pennsylvania summers. 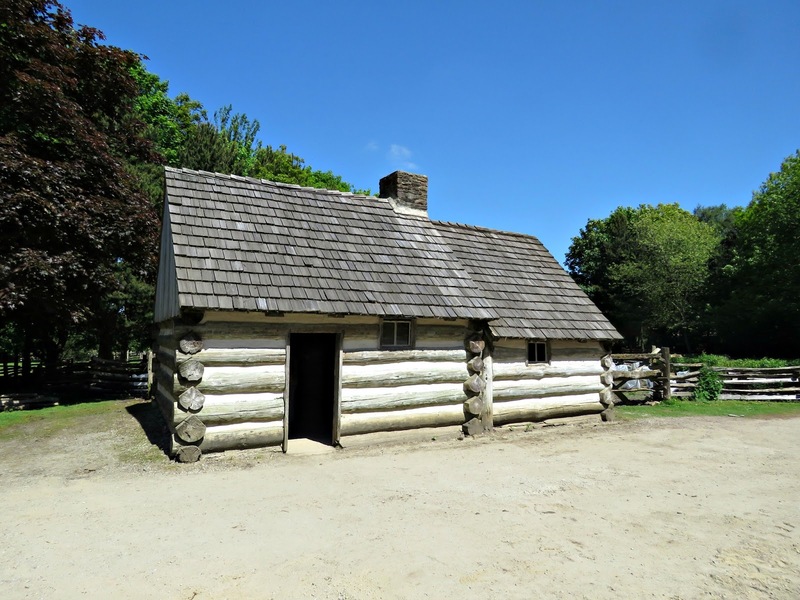 They’ve also got a replica of a two room log cabin that would have been the basic sort of starter home in the New World. 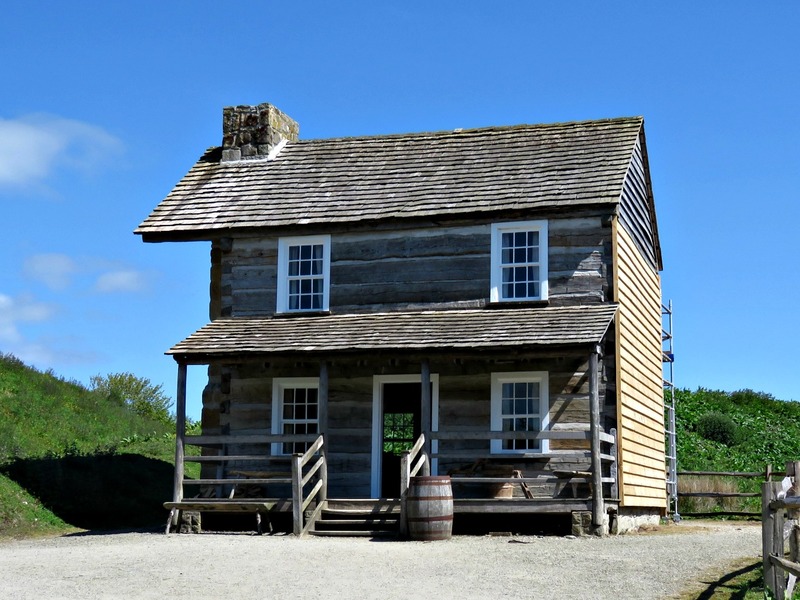 Then as the family prospered they would have built additional buildings such as a log barn, a corn crib, a smokehouse, a spring house and then, finally, when they had the resources and the time, they’d have built a log farmhouse to move into. There’s a replica of the one built by the Mellon family in Pennsylvania. 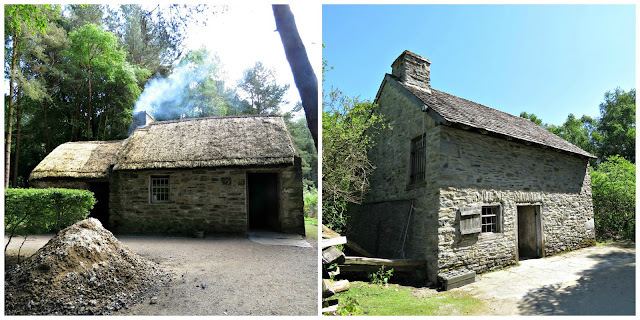 Further along they’ve added the McCallister House, built originally by Richard McCallister in the hills along Tyler Creek near Salt Rock in Cabell County, West Virginnia. Richard was American-born, but his grandfather, James McCallister, emigrated from Ulster in the 1720s. 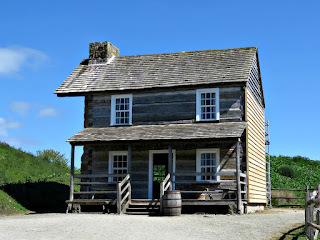 And the final house in the collection has recently been relocated from Sumner County, Tennessee. 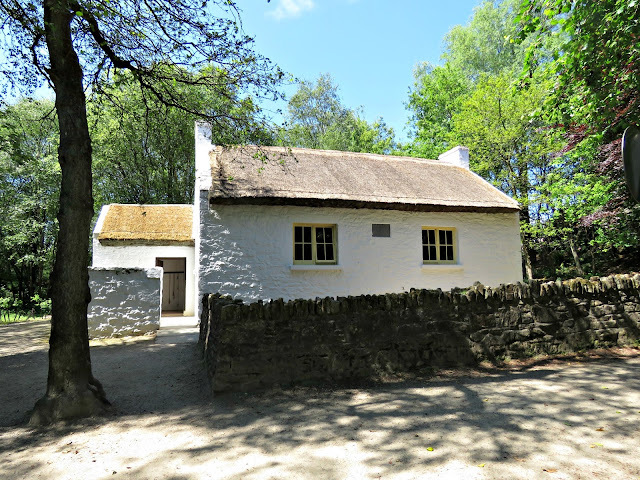 It was built by Francis Rogan, born in Sumner County, Tennesee in 1798 to an emigrant farmer called Hugh Rogan, who came from County Tyrone. Hugh had originally left Ireland with his brother-in-law, Daniel Carlin. Both men had fresh young brides for whom they promised to return. Hugh also had an infant son, Bernard. Eventually after ten years Hugh felt it was time to go home and fetch his family to live with him in America. Slippery Daniel, however, had other ideas. He’d found himself a new lady-love out west and wasn’t minded to return and face charges of bigamy back home in Ireland, so he played a dirty trick on faithful Hugh, who had never forgotten his lovely Ann Nancy back in Ireland. Daniel forged a letter to look as though it had been sent from home. It told of how Ann Nancy had given up on her husband ever returning and had taken a new husband. Heartbroken, Hugh, decided against a return trip. Another ten years passed, and finally, miraculously, a letter made it through to Hugh from Ann Nancy back in Ireland letting him know that she’d remained true and was still awaiting his return. To his credit Hugh didn’t think twice, and caught a ship back to Ireland where he reclaimed his beloved wife and got to know the 21 year-old son he’d not seen since infancy. The family returned to Tennesee and within a year, Bernard had a little brother, Francis Rogan, the chap who grew up and built this spacious brick house. 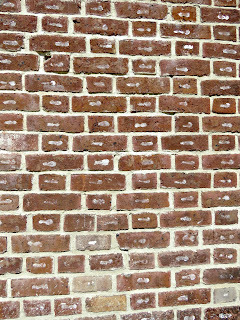 When we stopped by they’d still got marks on the bricks where they’d been labeled and numbered on being dismantled in Tennessee. The park is a special place. I remember coming here as a child, and looking in wonder at buildings that had been dismantled and crated and shipped from their original locations. 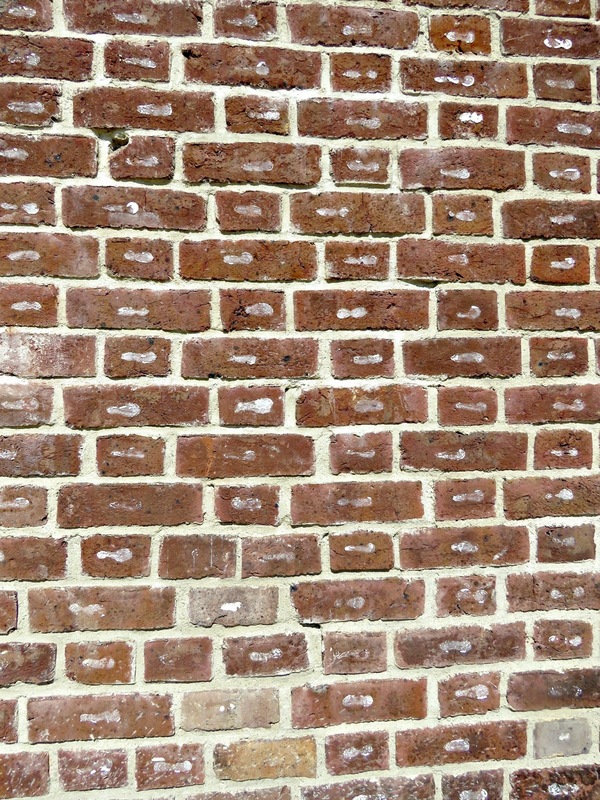 That brick-by-numbered-brick business struck me as an amazing act of devotion, and I still think it’s pretty cool. But, more than that, the park has been intelligently designed to tell a story, and it’s a story with a strong, vivid narrative that is articulately and compellingly told as you walk from buildings 1 to 43. In many ways it feels as though you’ve taken a trip back in time across the ages to a land that feels both foreign and familiar at the same time. 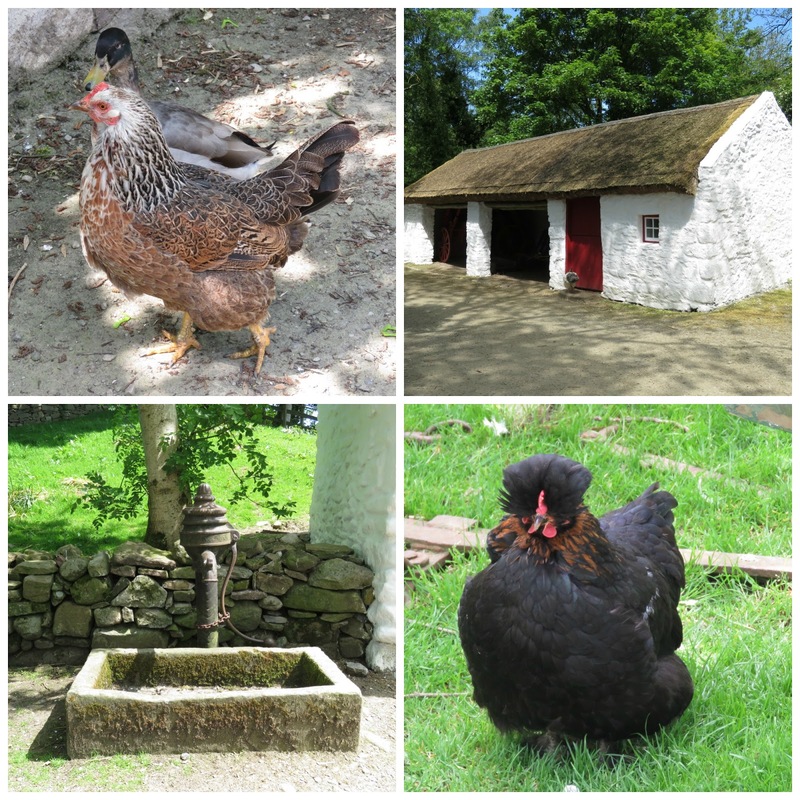 In the prosperous Ireland of today our emigrant ancestors who fled poverty and privation seem a bit alien. Sadly, however, the factors that forced their exodus: famine, civil unrest, war and persecution are still very topical in the wider modern world of today.